Recently I mentioned about CodeEval. I have been observing them since then and I just saw something interesting on LinkedIn. I know they have been aggressively marketing their services via multiple social networking channels. Here is an image of the conversation on LinkedIn. So, it looks like some guy is not able to submit his problem. So, immediately he concluded the website to be “Crap”. But what about the 1567 submissions (or is it users)? How did they manage to submit their programs? The truth of the matter is, there are usually two types of customers. Those who work with their vendors, understand issues since they are also vendors to someone else and their service also has problems at times and work towards an amicable solution. Then there are others, who at the first opportunity of running into an issue, criticize the software or the company or the people and some may even want their money back, even if it’s their fault. So the interesting thing to note is that just the way it’s easy to market something to a large audience via social networks, it’s equally easy to spread the negative publicity. In all possibility, it could even be a competitor trying to be a jackass. 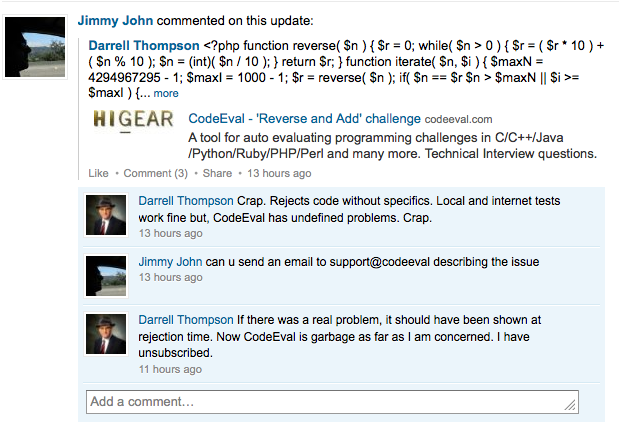 Note: I am not affiliated to CodeEval. I am a happy member of the community and think it has a good potential. Yesterday I had a bit of a panic moment. We went out and took some video. Later in the night wanted to watch it on my 27″ iMac. So, I took the SD card and put it into the slot which is on the side. Usually I pay attention, but not this time. But I did find it something different. Before I realized what happened, I inserted the card almost. I actually inserted it into the CD/DVD slot by mistake. Problem is, both the slots are very close (so after this incident it reminded me of an old joke I heard about what professional God is, something along the lines that he is a Civil Engineer else who would put two completely unrelated holes together). So, as soon as I realized my mistake, the card was still out a little bit and I tried to pull it out. But things got worse, it went inside. That’s the first time I also realized that the iMac’s DVD slot has some kind of a sponge lining. Not sure why that’s required, may be a good thing for inserting and removing DVDs but in this case, that made it more complex. Suffice it to say I did a few more stupid mistakes and finally the SD card went deep inside and I had no clue where it was within the entire DVD slot area. Slowly my panic mind regained a bit of sanity and then I searched the web and found some Youtube videos on how to remove it. One of them gave an apt name “Fishing SD Card out of a DVD slot” or something like that. Yeah, it was almost like Fishing (I think since I never did fishing :)). Now, slowly insert this and try to feel for an obstacle and try to keep scoping out. You may not exactly feel like an obstacle. But keep trying to insert this card from one side of the slot, put it all the way in and try to keep moving around and pulling out. Don’t worry about it going into CPU or harddisk or something. While I don’t know the internals, I think the DVD slot is a close enclosure that prevents your L card going to other components. I advice you also to go to Youtube and see how people are doing to get comfortable with this whole idea of fishing :). This worked for me and I was so glad about it. Otherwise, I would have lost the memory card with good videos and my ability to watch DVD movies from my iMac. Are you losing to your competitor? Few years back using my experience in a certain area, I created a piece of software and gave it a name and created a website with the same name and started selling it. It’s a very niche area and the only a small set of the target audience actually seek the solution and pay for it. My software is priced $$ and my sales are single digit. So, the potential is less than a thousand per year. But who knows, with time it could have become a little bit more. On the contrary, after about an year, things went the other way. Hardly anyone evening contacting to find more info. Yeah the economy had been bad since 2008 and all that, but that’s not the reason for the dismal performance I had. Out of no where, some guy started offering a similar solution for free. People are expected to register a domain name and us his solution by mapping their domain name to his server. Which is fine. You could say, if someone could offer it for free, why do you think anyone would pay you $$? First, there are some problems with what is being done by that person. I won’t go into those details. But what I don’t think is appropriate is, for that person to optimize his website around my product. He literally used my product name which is very specific and tried doing SEO around it. Given his customers map their domain to his server, he is getting free links back from all these websites to his main site and in the anchor links he even used my product name. So, the theme is “An alternative to xyz” or “An xyz for free” and so on where xyz is my product name. Only because my product name and my domain name are the same and since Google atleast has the sense of giving a domain name a lot more importance, when someone searches for xyz, my website does come first. But the problem is, the next link in the results is his which says “A free xyz”. That’s how I got screwed and hardly had any one wanting to purchase my product. The truth of the matter is, there are clear advantages of buying the software, installing it on one’s own server and using it vs mapping one’s domain to a free solution. However, when you are looking at search results, it’s not possible to explain the potential customers what the differences are. I am not sure how this can be solved by Google or anyone. Today something interesting happened. I was offered a deal to link to a web page. I checked the web page. It was about someone who was born in the first quarter of the last century. So, why would anyone bother about doing search engine optimization for this man? What’s the need? I was completely baffled. Then I started my investigation. It wasn’t too difficult to figure out the reason. Now this person’s family follows naming their future generations with the same name but adding those roman numerals like “So and so, the third”. And it turns out, this person’s grand son happened to have gotten some bad news articles. So, when you search for the person, you get web pages for all the three generations. But it so happens, that the bad news is glaringly visible as one of the top posts. I won’t tell who this person is, I would just provide a few hints for the curious to do their own research. First, the family is rich and publicly known. Before I give the second hint, I want to tell about another interesting thing. So, the bad news article I am talking about is not like just recently published. It’s almost a year old. Hmm, so why would anyone bother to defend their reputation now? Either they may have done it then, or just don’t bother about it and move on. It may be possible that only recently Google started showing that article higher up. Not sure. But there was another turn of events that slowly unraveled today in the tech industry. Something that started on Sep 21st concluded on Sep 22nd. It’s significant news for the stock market and the silicon valley. So, in fact, that’s what actually made me to piece together easily. I know there are companies making money out of getting rid of the bad publicity from the web by doing all these types of SEO techniques. So far I have mostly noticed it for companies. But over the last year or so, the activity seems to be picking up for individuals, especially the rich and public figures with some skeletons in their closets (either for them or their family members). While I am at this topic, another interesting thing I noticed in this area of “reputation defending” is, one small company is a so called “certified partner” of a very large company and the large company has a page on their website about this partner (they have a directory of their partners and this is one of them, nothing other than that from SEO point for the large company). So, the small company (or the people whom they are working with to improve their image) has chosen to do SEO for their profile page on this large company. This is interesting because, while it may be difficult for a small company to get better SERP even with all SEO techniques, as their website itself may not have a good pagerank, it’s likely to be very easy to get a better pagerank from a larger company. Never mind that there is no link back to this small company, never mind that the large company web page will be showing up when searched by the name of this small company, it’s still OK, I guess. Mainly because, when searched by name, since the domain name has sufficiently large weightage, the first result is likely to be the small company anyway. So, they are just trying to push down some other undesired results off of other websites, by increasing the ranking of another page from a more popular website. Interesting technique. Black hat? White Hat? I don’t know, I don’t care, I am not in the SEO business myself. But I do like to monitor what’s going on in these areas because, a) just out of curiosity b) I can make sure I am not getting dinged for my websites by others because of this type of techniques. I am going to write my next post about how I did get screwed by a rogue competitor and there is not much that can be done.